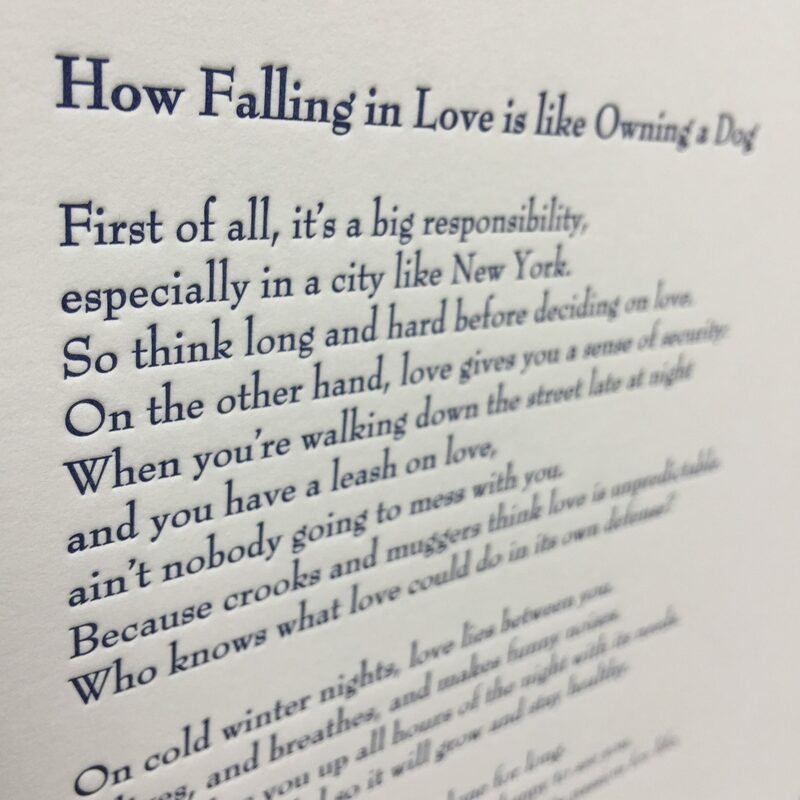 Letterpress Broadside: “How Falling in Love is like Owning a Dog” - Taylor Mali and mentioned in The New York Times) since its composition in 1998 (for a wedding!). Printed on thick rag paper, the indentation of the letterpress is satisfyingly tangible and almost feels like braille on the other side. Each print measures nine inches by twelve and easily drops into a standard frame (with perhaps a little bit of trimming). 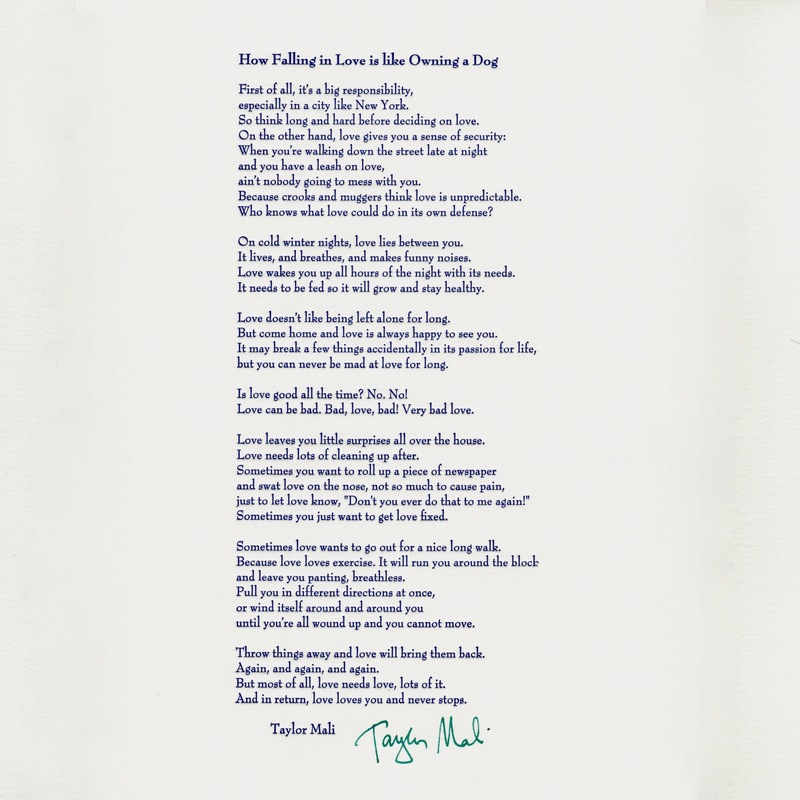 If you are buying this broadside to give as a wedding gift or to perform at the ceremony, use the comment box below to let Taylor know the names of the couple (as well as any dogs they might have) and the date of the wedding; he will personalize the inscription and pre-date (or post-date for anniversaries) his autograph. If you would like, Taylor sometimes crosses out the words “New York” at the end of the second line and changes it to wherever the location of the wedding or the hometown of the couple in his neatest “teacher writing.” The end result with the “corrected” city name has been described as “adorably awkward” (see photos below). If there’s something else you’d like Taylor to include in his inscription, make a note of it below. NEW: If you buy five copies, the price drops! Get one for you, one for the happy couple, one for the officiant, and one each for the parents! If you are buying multiple copies, just list in the comment box to whom they should all be inscribed? These poems are not printed “on demand.” They are the gorgeous handiworks of an artisan letterpress operator at Print Icon in New York City that Taylor calls his “go to old-fashioned printer.” Requests to “replace the typeface” or “add a stanza” will be secretly met with sighs and face-plants. 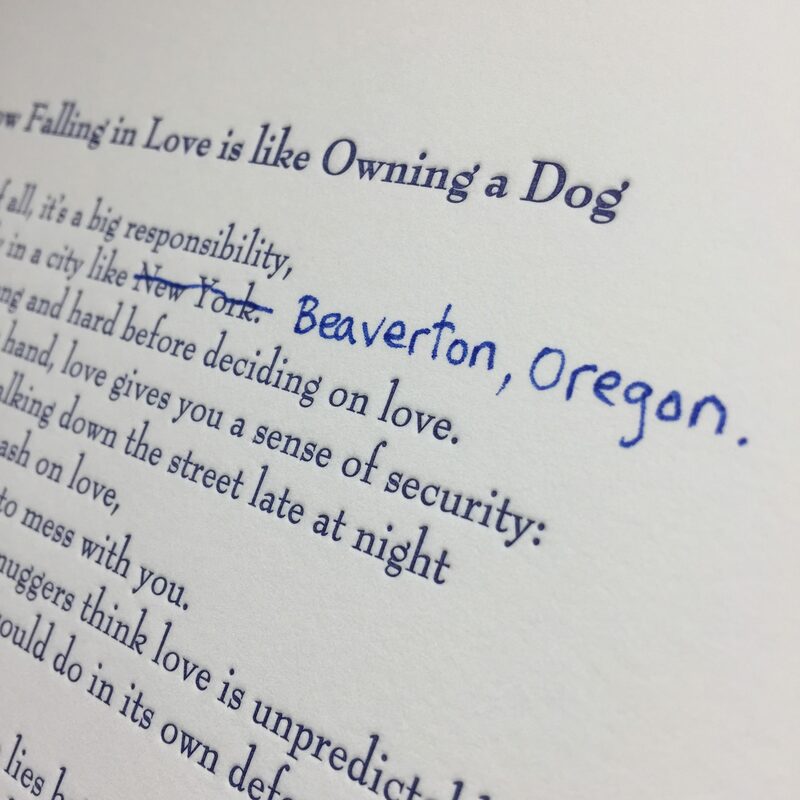 A beautifully formatted, hand-printed, autographed letterpress edition of Taylor’s most popular love poem, which has been read at hundreds of weddings (and mentioned in The New York Times) since its composition in 1998 (for a wedding!). 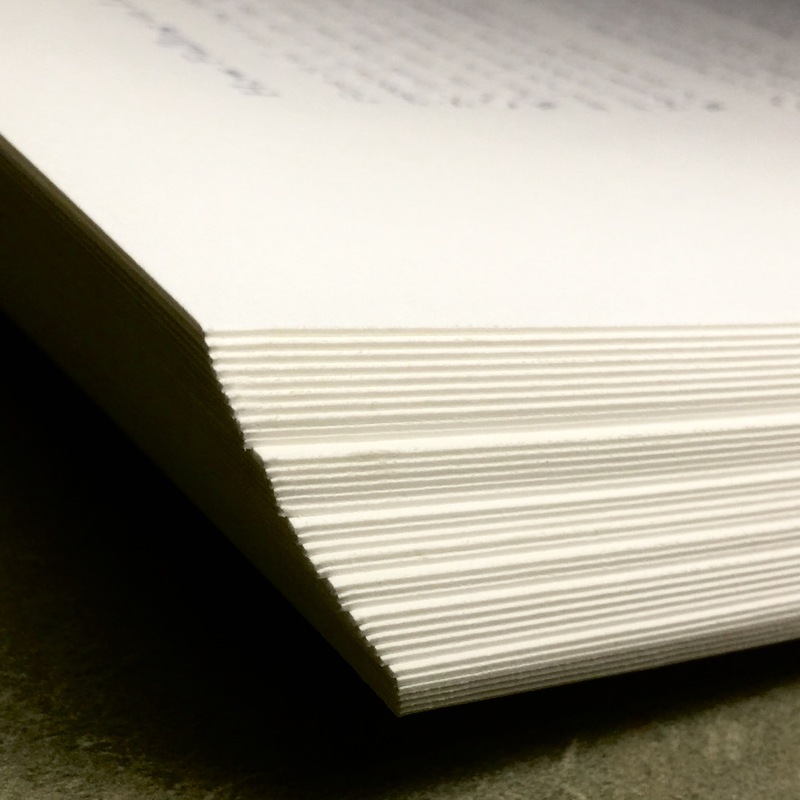 Printed on thick rag paper, the indentation of the letterpress is satisfyingly tangible and almost feels like braille on the other side. 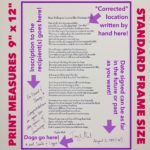 Each print measures nine inches by twelve and easily drops into a standard frame (with perhaps a little bit of trimming). 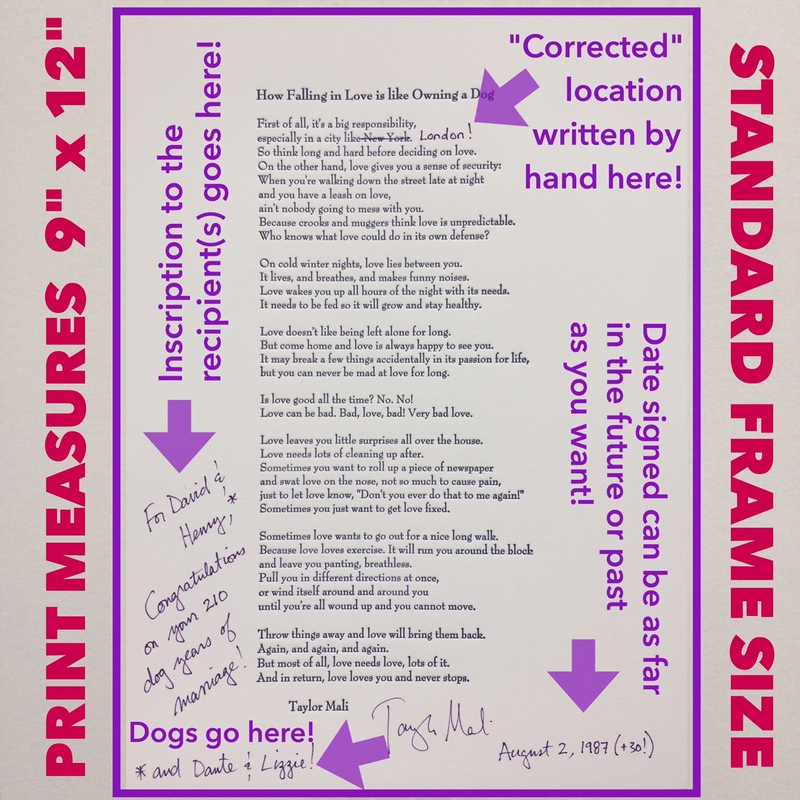 If you are buying this broadside to give as a wedding gift or to perform at the ceremony, use the comment box below to let Taylor know the names of the couple (as well as any dogs they might have) and the date of the wedding; he will personalize the inscription and pre-date (or post-date for anniversaries) his autograph. 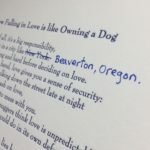 If you would like, Taylor sometimes crosses out the words “New York” at the end of the second line and changes it to wherever the location of the wedding or the hometown of the couple in his neatest “teacher writing.” The end result with the “corrected” city name has been described as “adorably awkward” (see photos below). If there’s something else you’d like Taylor to include in his inscription, make a note of it below. NEW: If you buy five copies, the price drops! Get one for you, one for the happy couple, one for the officiant, and one each for the parents! If you are buying multiple copies, just list in the comment box to whom they should all be inscribed? These poems are not printed “on demand.” They are the gorgeous handiworks of an artisan letterpress operator at Print Icon in New York City that Taylor calls his “go to old-fashioned printer.” Requests to “replace the typeface” or “add a stanza” will be secretly met with sighs and face-plants.